In just two days, I head to the East with my one-way ticket. Usually, I start packing for moves at least two weeks in advance. Something just isn’t right because I have yet to retrieve my suitcases from the basement! I suppose it’s just nerves. However, I am excited to spend my first few days exploring the city with Karl. Our first planned stop is to Flour Bakery + Cafe. I am a huge fan of the owner, Joanne Chang. She is a Harvard graduate turned professional baker and cook, or in other words, a rockstar! Her cookbook, Flour, Too, is fantastic! After we have our fill of sticky buns and Boston creme pie, it’s on to the amazing seafood and historical sites. Once the novelty wears off, I am worried the homesickness will come on, so I have taken steps to prepare for this … with food of course. When I am feeling down or a little blue, I turn to comfort foods to perk me up. 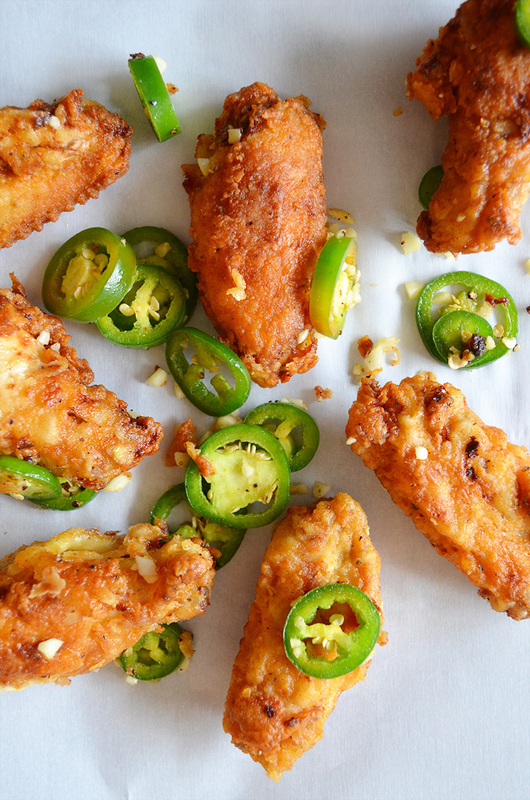 For me, there is nothing more comforting or perk-inducing than chicken wings. 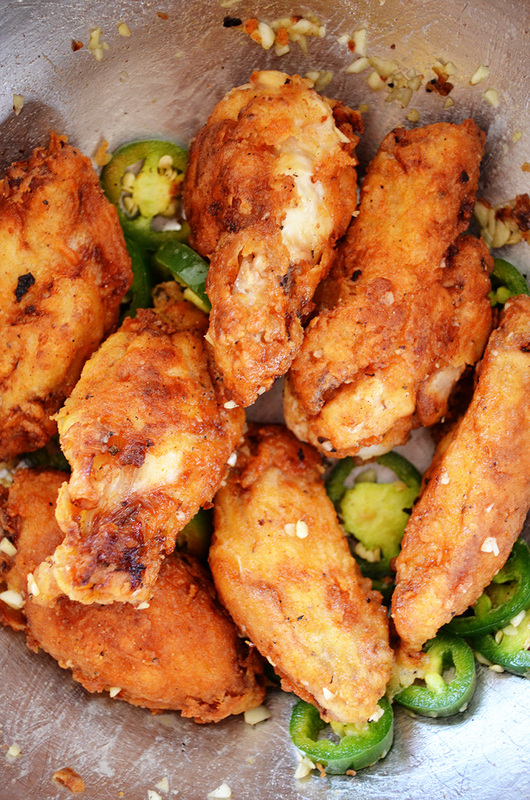 I love the classic Chinese salt and pepper chicken wings, so I created my own recipe to have when I’m feeling homesick. These wings are so simple, but so delicious! I marinated the wings in a simple buttermilk mixture for a few hours, then I dredged them in a seasoned flour mixture. 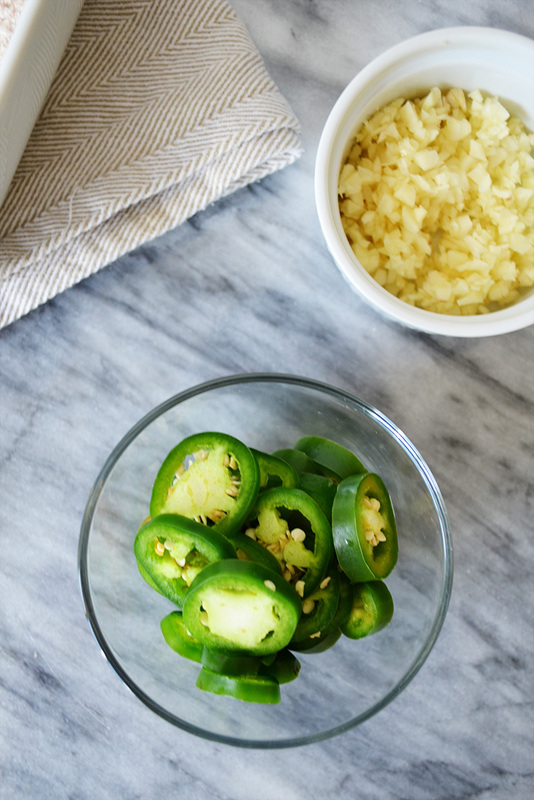 Fry them in some oil for about 8 minutes, then toss in the jalapeno and garlic. You absolutely need an oil thermometer to fry chicken. The oil temperature fluctuates a lot, and it is impossible to know when to add the chicken without a thermometer. Trust me, I’ve tried frying chicken without one and it was a disaster! I didn’t want these wings to be spicy, so I tossed in the jalapenos at the end for a nice little kick. I can’t believe my next post will be in my new apartment! I’ve only seen a few pictures of the kitchen, so I am really hoping there’s a lot of natural light in the kitchen! Now, it’s good-bye to you all, but just for a short while! Place the chicken in a large baking dish. Space out evenly so that none of the pieces are overlapping. Sprinkle 1 tsp paprika, 1 tsp freshly ground black pepper, 1 tsp garlic powder, 1 tsp onion powder, and 1 tbs salt over the chicken wings. 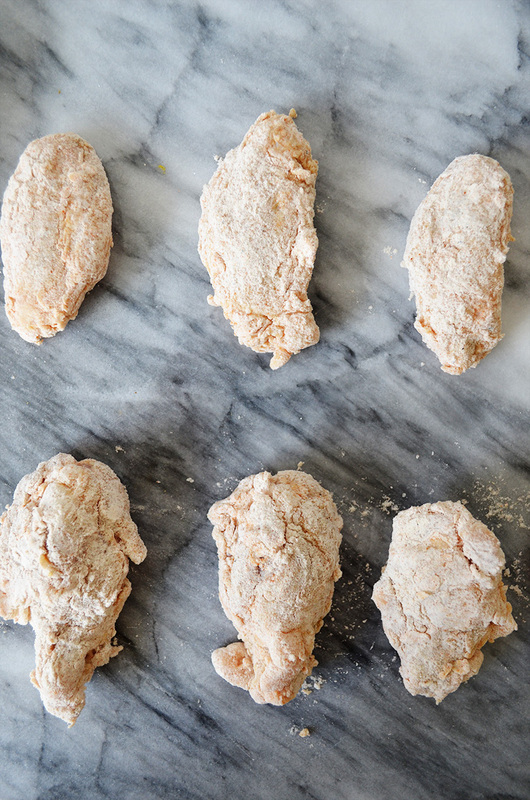 Pour the buttermilk over the chicken wings, then mix to coat each wing evenly. Cover with plastic wrap, then refrigerate for 4 hours. Prepare the dredge by mixing together the flour, 1 tsp paprika, 1 tsp freshly ground black pepper, 1 tsp garlic powder, 1 tsp onion powder, and 1 tbs salt in a medium size bowl. Take the chicken out of the fridge. Shake off the excess liquid, then dredge each piece on both sides in the dry mixture and place on a plate. Line a large plate or serving dish with paper towels, then set aside. Pour the vegetable oil into a dutch oven or large saute pan. Allow the oil to heat up to 375F degrees. Place about 6-8 pieces of chicken wings in the oil at a time, and cook each side for about 7-8 minutes. Transfer to the paper towel-lined plate to drain the oil. Repeat until all the chicken is cooked, but always allow the oil to return to 370-375 degrees F before frying another batch of chicken. Place the chicken in a large mixing bowl, toss the chicken with the sliced jalapeños and minced garlic and more salt and pepper to taste. Plate then serve immediately. This entry was posted in Appetizers and tagged chicken. Ohh what a cool way to cook chicken! I must try this for my family! in step 2 if u sprinkle the spices on the chicken then pour the buttermilk over it won’t it wash away the spices? Hi Ralph! 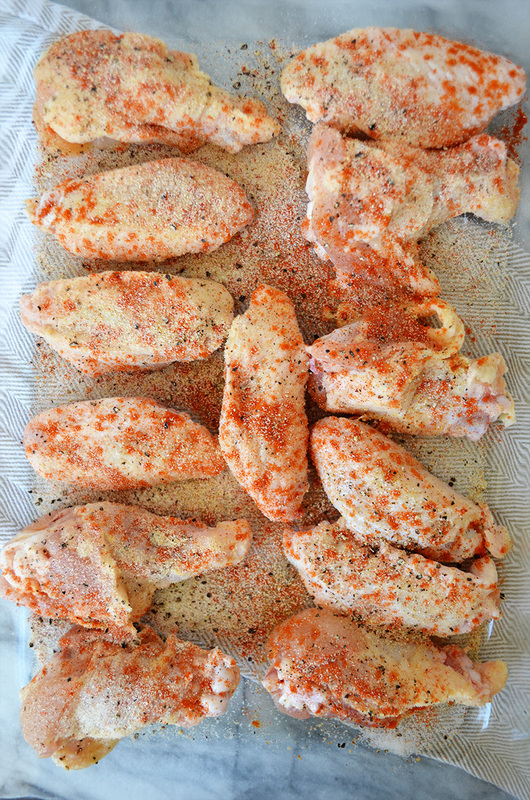 At this step, the buttermilk and spices will marinade the chicken together (: You’ll re-dredge the wings with spices at step 4! It’s delicious! !